NASA scientists and engineers are devising new ways to study how low-lying clouds and aerosols influence the climate. For climatologists, the role of clouds on the climate remains one of the highest remaining uncertainties. Aerosols affect the climate by altering reflectivity of the earth's atmosphere and nucleating clouds. For the next three weeks, scientists will test fly new sensor devices that NASA mission leader David Starr says "will dramatically change what we can do from space to learn about clouds and aerosols." The sensors are called polarimeters. Polarimeters measure the polarization of light and can provide details about size and shape of tiny particles. If you think of light as a wave (like a sine wave), the plane of the wave is described as its polarization. Sunlight is unpolarized, which means that the planes of the light waves are randomly oriented. When unpolarized sunlight interacts with the earth's atmosphere and surface, the light can be polarized in different directions depending on with what material the light interacts. By studying the polarization of light as it interacts with clouds, airborne particles, and the earth, scientists hope polarimeters will offer an unprecedented method of studying the properties of different clouds, and identifying the different aerosols in the atmosphere. Flying up to 70,000 feet above ground on NASA's high altitude aircraft ER-2 the three different polarimeters will simulate the view from space, acquiring detailed information on the clouds and aerosols. In the test runs during the Polarimeter Definition Experiment (PODEX), the scientists hope to determine how a polarimeter in space should be designed and how to translate the data into useful information. The size of water drops and ice crystals in clouds is one piece of useful information they hope to parse out with polarimeters. 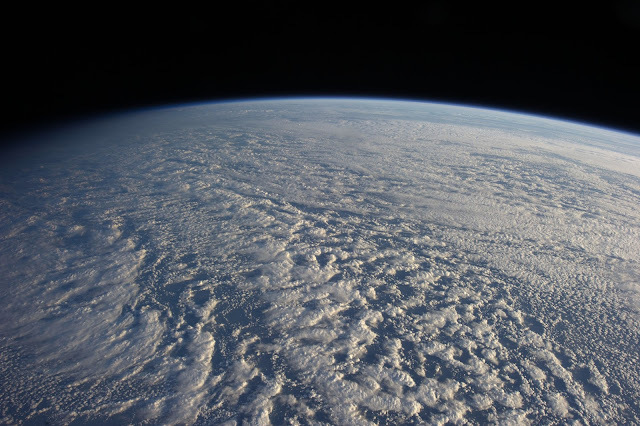 "For clouds of liquid drops, the size and quantity of the drops determines how much solar radiation they will reflect," Starr told NASA, "for example, low-level stratocumulus clouds cover vast areas of the ocean and strongly regulate the heating of the ocean by blocking solar radiation before it gets to the ocean surface. Polarimetry measurements from various angles offer the promise of more robust measurements of droplet size...even relatively small differences can be significant for climate." For aerosols, scientists hope polarimeters will offer insights unattainable by the current methods of atmospheric testing on NASA's Terra and Aqua satellites. Aerosols are the minuscule airborne particles from windswept sea spray, the exhaust from cars, or the CFC's once used in asthma medicine and hairspray. They affect human health, cloud formation, and alter the climate by changing the reflectivity of the earth's atmosphere. Starr hopes that with polarimetry, for the first time scientists may be able to estimate composition of these airborne particles from space. Are We All Just Part of a Computer Simulation?